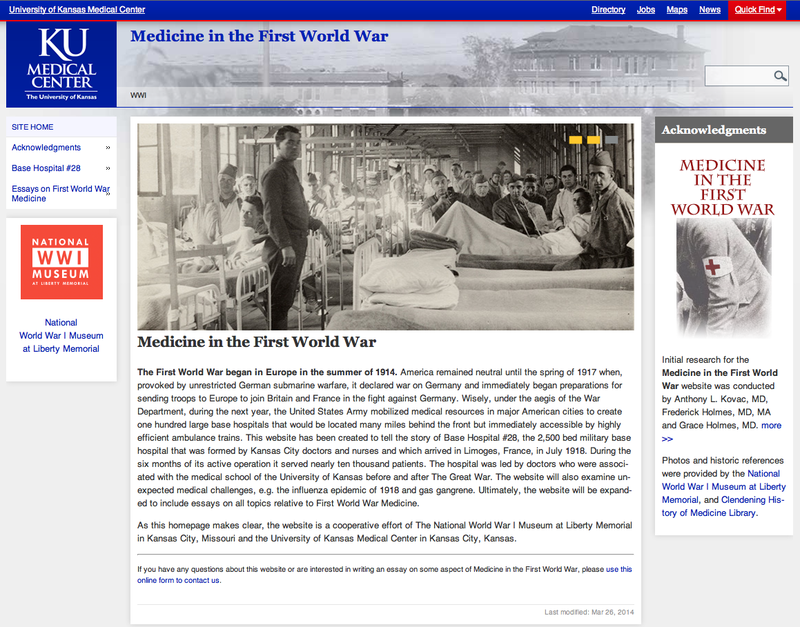 The University of Kansas Medical Center in collaboration with the National World War I Museum has created a website dedicated to Medicine in the First World War. The website features primary sources and essays about Base Hospital #28, the unit where most of the physicians, surgeons, and nurses who left Kansas City for France in 1918 worked. Since 2009, KUMC and the Department of History and Philosophy and Medicine have supported a First World War Medicine Study Group. Comprised of faculty, support staff, and many others, this group has been examining hospitals and medical practice on the Western Front, 1914-1918. The principal aim of the First World War Medicine Study Group is to increase and expand the study of regional primary source materials with presentations and publications. The group has already given 35 presentations and lectures, developed 5 posters, and published 2 articles in scholarly journals. And this is just the beginning! Stay tuned for updates about upcoming lectures over the centennial period, 2014-2018. This entry was posted in KU WWI Announcements and tagged First World War Medicine Study Group, National World War I Museum by kucgis. Bookmark the permalink.